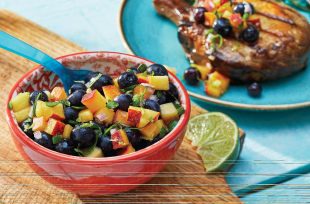 Stir together peach, blueberries, shallot, jalapeno, basil, mint, lime zest, lime juice, maple syrup, ginger and salt. Let stand 10 min. before serving with grilled pork or chicken, tortilla chips or baked brie.